ANN ARBOR, Mich. (AP) — Emoni Bates walks out a front door of Clague Middle School with just inches to spare. A wide smile tops his 6-foot-7, extra-lean frame. He’s holding a seventh-grade honor society certificate in his right hand. His braces gleam in the afternoon sun. 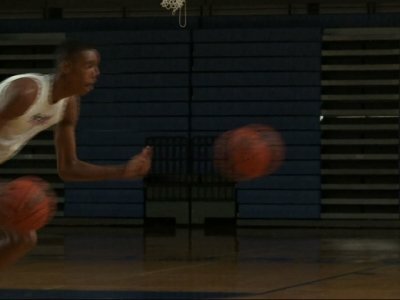 Meet the best 13-year-old basketball player in America, according to some recruiting services. One of his highlight reels on YouTube has been viewed about 1 million times. “I don’t really pay attention to it,” Emoni insists in a voice just louder than a whisper, “because if I pay attention to it, it’s just going to get to my head. Emoni’s father, E.J. Bates, has been around the game most of his life. He picked greens and baled hay as a kid in nearby Milan, Michigan, then developed into a smooth-shooting guard. But he didn’t take school seriously until it was too late. Instead of playing for a basketball power like Kansas and maybe even in the NBA, E.J. wound up going to Kentucky Wesleyan and settling for pro hoops in Switzerland. E.J. is determined to make sure his son doesn’t make the same mistake. The academics are a sign of that. House rules bar Emoni from picking up a basketball until his homework is done. Yet E.J. knows when kids are this good this early, distractions roll in like waves. Already, it seems, lots of people want a piece of Emoni. Prep, private and public high school coaches are lining up. Colleges have him on their radar. DePaul took it a step further, offering Emoni a scholarship in late August. Two other much-touted players in the Class of 2022 — Amari Bailey of Illinois and Skyy Clark of California — also have offers from DePaul. E.J. knows the shoe company bird dogs and other hustlers looking to buy favors are lurking, too. So he and wife Edith, who works for the Red Cross, keep their inner circle very tight. The Bates family has agreed to provide The Associated Press with a rare, behind-the-scenes look at the life of one of the most coveted basketball prospects in the country for at least the next five years. The periodic series will include video, photos, audio and text updates to track his progress. Will Emoni stay near his current home to attend a public high school? Or will he take his next step at a private school like Detroit Country Day, like Michigan native Chris Webber? Will he follow the footsteps of Marvin Bagley III and other five-star prospects, reclassifying to finish high school in three years? Bagley did to play college ball at Duke this coming season — and potentially to get a jump on a pro future. Will E.J. and Emoni emulate the father-son team of LaVar and Lonzo Ball, grabbing headlines while hawking their own brand at every turn? E.J. says all options are on the table. But he won’t be loud, unlike LaVar Ball in the lead-up to his son Lonzo being drafted by the Los Angeles Lakers. Emoni James-Wayne Bates was born Jan. 28, 2004, at the University of Michigan hospital. He was on the light side — 6 pounds, 7 ounces — and a little long at 21 inches. Just over a year later, Emoni slept with his head cradled in his left arm and his right wrapped around a black and red basketball. A cherished photo was made. There were more hints. During a second visit to the doctor, E.J., who is 6-foot-4, and Edith, 5-9, asked how tall their son might grow. Emoni has shot up 7 inches in the last two years. He’s tall enough right now to play shooting guard at any level. He handles the ball like a point guard and launches 3-pointers like a savvy veteran. He can create his own shot like a wing or drive the lane and dish off to a teammate like another rail-thin former prodigy, Golden State Warriors star Kevin Durant. But adding weight and muscle is an ongoing challenge. He weighs just 155 pounds — not heavy or strong enough to play a dominating inside game that would complement his fluid perimeter skills. “We try to stuff him full of food at night and hope it sticks,” E.J. sighs. The Adidas Invitational in Fishers, Indiana, attracts some of the Midwest’s top seventh-grade AAU teams. Inside Best Choice Fieldhouse, talk centers on whether the Bates Fundamentals squad starring Emoni and coached by E.J. can live up to the hype. “They’ve been hearing a lot about him,” says Bernetta Kelly, watching her son’s Peoria Area Elite team take its shot. Bates Fundamentals wins 95-44 and Kelly understands why. She approaches Emoni and asks for a photo with her son and his team. This highlight reel posted by CityLeagueHoopsTV on YouTube stood at just over 990,000 views the morning of Sept. 21. After another lopsided victory in the two-day tournament won easily by Bates Fundamentals, Emoni walks off the court. A younger competitor darts out of his team’s pregame layup line to slap his hand. Moments later, the excitement follows Emoni out the door. “Hey, that’s him,” a young boy entering the facility says to teammates. How does a 10-year-old from Fort Wayne, Indiana, know who Bates is? The highlight reel posted last summer had nearly 1 million views before Emoni walked into the doors at Clague for the first time as an eighth-grader. Several other videos have racked up 500,000-plus views in less than one year. By the spring of 2018, the suspense about where he plans to attend high school may be its own mini-drama. Then a few years later: Which college? E.J. and Edith hardly need reminding that’s still a long way off. As good as the recruiting services have become at projecting stars, it’s easy to forget the object of all that attention is still just 13. At times, the recruiting experts simply miss. Yet fans of two college basketball powers with the inside track can already start thinking about the fall of 2021, when Bates can officially sign a scholarship offer. In quiet moments, Emoni sometimes does, too. Asked about his favorite programs, the soft-spoken kid doesn’t hesitate to name the early front-runners. “Michigan State and Kentucky,” Emoni says.